Blackstone's Police Manuals, available in four volumes, are the leading police reference texts in the UK. Written in consultation with police forces across England and Wales, the Manuals are the only study guides endorsed by the National Policing Improvement Agency for OSPRE Part 1 Promotion Examinations. 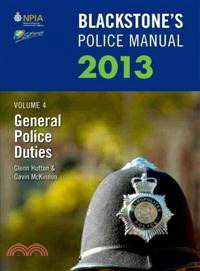 Blackstone's Police Manual Volume 4: General Police Duties 2013, in line with the new OSPRE syllabus, covers all the relevant subject areas for candidates, including Terrorism and Associated Offences, Complaints and Misconduct, Weapons, and Public Disorder. Straightforward and accessible, each chapter offers a logical progression through the material and is extensively cross-referenced to provide a deeper understanding and more complete perspective of police duties. For complex or commonly misunderstood areas, there are handy Keynote boxes, which point to relevant case law or provide an example of how material is used in a practical sense, helping candidates to assimilate the information better and establish the connections between legislation and police procedure. The 2013 edition has been updated to incorporate all recent legislative developments and case law, including coverage of the Police Act 1996, the Police Detention and Bail Act 2011, and the Crime and Security Act 2010. Also includes coverage of Police and Crime Commissioners and the Mayor's Office for Policing in London, under the Police Reform and Social Responsibility Act 2011, as well as the new National Crime Agency. Blackstone's Police Manuals continue to be the most accessible, relevant, and focused revision materials for Promotion Examinations. Widely used by trainers as well as police officers going for promotion, their breadth and scope also make them an invaluable resource for anyone involved in police and criminal law. Also available in the series are: Volume 1: Crime 2013, Volume 2: Evidence and Procedure 2013, and Volume 3: Road Policing 2013. Blackstone's Police Manuals are also available as an online service offering fast desktop access to the complete text of the four Manuals. Glenn Hutton BA, MPhil, FCIPD is a Director of Psychometric Technology Limited which designs and publishes psychological tests and provides selection and assessment services. Formerly a Superintendent in North Yorkshire Police, he also worked as Head of NPT Examinations and Assessment, Head of Training in North Yorkshire and as both Course Director and Director of Studies at the Police Staff College, Bramshill. Gavin McKinnon LLB LLM MSt MCIPR FCMI is the Head of Corporate Communications for Kent Police. Formerly a Chief Superintendent, he served with the National Policing Improvement Agency, and the RUC/PSNI. He also worked as Deputy Director of Police Reform at the Home Office, and was Head of Crime & Justice for the think-tank Policy Exchange.